Matthew Charles Sanders (born July 31, 1981), better known by his stage name M. Shadows, is the lead vocalist, songwriter, and founding member for the American heavy metal band Avenged Sevenfold. Shadows possesses the voice type of a high baritone, and is well known for his distinctively gritty singing style as well as occasional screaming. Shadows began singing at an early age, but his interest in rock music grew as he became older and began to play the guitar. Shadows links this early musical experience with the piano as a major factor in developing his skills with the guitar and his voice. He attended Huntington Beach High School, where he played for a brief stint in a punk band named "Successful Failure". Following this, Shadows formed Avenged Sevenfold in 1999 along with high school friends Zacky Vengeance, Jimmy "The Rev" Sullivan, and Matt Wendt. Soon after, Sullivan's friend Synyster Gates joined Avenged Sevenfold as the lead guitarist. In the DVD "All Excess ," Shadows claims that everyone in the band had been assigned to come up with a list of names, but that only he had followed through. The name Avenged Sevenfold, a reference to the Book of Genesis, was chosen over Lips of Deceit, another Biblical reference. Shadows, like the other members of Avenged Sevenfold, uses a stage name. In an interview, Shadows says that he chose "M. Shadows" as his stage name because he thought of himself as "the darker character in the group,". The M is in place of his first name, Matthew, which he did not want to be in his stage name because of the way it sounded. He also added that he and the band took stage names because many other successful musicians that they were influenced by had them (e.g. Slash of Guns N' Roses and Munky of Korn). Shadows' vocal style has evolved significantly over the years. On the band's first full-length record, Sounding the Seventh Trumpet , he features a harsh, metalcore-style scream, with limited instances of clean vocals. The release of Waking the Fallen in 2003 showed his progression towards more melodic vocal lines, but his voice still demonstrated a strong metalcore influence. The most important change, however, came with the release of the bands major label debut, City of Evil, in 2005. The album featured no screaming and much more defined vocal melodies, with an increased emphasis on vocal hooks. This style has remained prevalent on every record the band has released since that time, with the exception of the song "God Hates Us" on their album Nightmare, and newer released song "Not Ready To Die", which both return to the metalcore sound of earlier releases. Rumors began to spread that Shadows had lost his ability to scream due to throat surgery he had needed after Warped Tour 2003 . However, this is not true. Producer Andrew Murdock put down these rumors by saying "When I met the band after Sounding the Seventh Trumpet...Matt handed me the CD, and he said to me, 'This record's screaming. The record we want to make...is going to be half-screaming and half-singing. I don't want to scream anymore...the record after that is going to be all singing.'" Later on the album Nightmare M. Shadows screams on the track "God Hates Us" by returning back to harsh, metalcore -style scream. Shadows draws his singing and performing style heavily from classic metal bands. He cited Guns N' Roses as his biggest influence in an interview, commenting that "I love that band. You can compare us all you want — they're a huge reason why I'm even in a band and even write music." Shadows also commented that he was heavily influenced by Metallica, Megadeth, Slayer, Ozzy Osbourne, and Pantera. Megadeth and Metallica, Shadows says, are the reason why Avenged Sevenfold try to infuse a classic metal sound into their music. "Metalheads are so bitter, they're like, 'Why doesn't a super-extreme band have all the success that Avenged Sevenfold is having? '," said Shadows in an interview, "It's 'cause we have that traditional classic sound that bands like Metallica and Megadeth paved the way for a while ago. That sound crosses over and the extreme metal doesn't," he added. He also stated later in that interview that guitar expert Scott Taylor taught him how to play guitar. Shadows was one of the founding members of Avenged Sevenfold, along with The Rev and Zacky Vengeance in 1999. In 2001, the band released their first studio album, Sounding The Seventh Trumpet . The self-produced album, which was in the metalcore style, gained mixed to positive reviews from critics. Following the success of their first album, the band released a second album, Waking the Fallen , in 2003. Later in 2003, Shadows and Avenged Sevenfold played in the Vans Warped Tour. Shadows has made guest appearances on numerous albums by various artists. He is featured on the Steel Panther album Feel the Steel and sings a verse of "Turn Out the Lights." He also produced The Confession's 2007 album, Requiem, which, according to an interview, was one of the first steps which led to Avenged Sevenfold self-producing their 2007 self-titled album. M.shadows Sing with slash !! It's a very good song !! I don't care about your bads comments ! 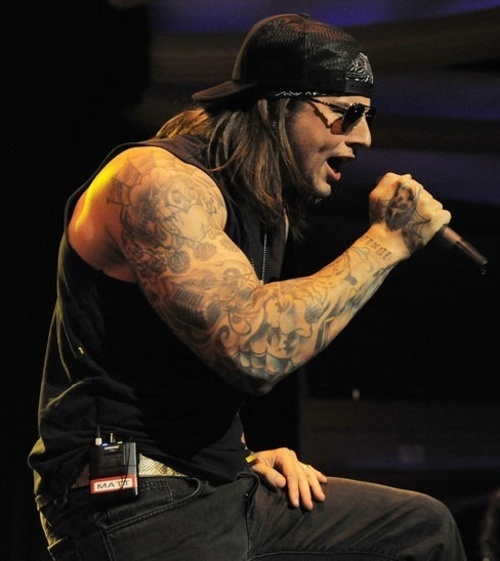 I'ts a good song because it's M.shadows who sings. All the songs who M.shadows sing !! IT'S GOOD ! Because he have the most beautiful voice IN THE WORLD ! !